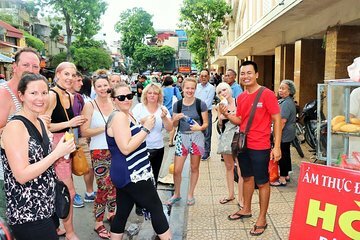 Greet your gastronomic guide and group at Dong Xuan, the largest covered market in Hanoi, to begin your culinary tour. Inhale the aromatic scents exuding from street hawker stalls and follow your nose to stands replete with exotic fruits and fresh seafood. Listen as you guide explains the culinary context of the city and hear about the cultural significance of local specialties. After sampling a selection of snacks at the market, venture to Hanoi’s Old Qaurter to absorb the antique ambience of the area. Visit a local restaurant to watch expert chefs at work, then take a seat to dine on banh cuon, a delectable local dish of crispy pork crepes. Stroll down labyrinthine lanes to pleasure your palate with flame-grilled meat at barbecue stands and marvel at the color and charisma of the vibrant area. Conclude your feast with a sweet treat made from condensed milk, crushed ice and fresh fruit, then settle into a seat in a secret café famed for its spectacular views over Hoan Kiem Lake. Sip the local specialty of egg coffee and bid your guide and group farewell in this ambient establishment. Please note that this tour visits independent, family-owned businesses whose operating schedules and menus may change. Therefore, street food venues and local dishes often vary; your local guide will make any final adjustments on the spot. Decided to do the street food tour first day in Hanoi as the same tour in Saigon was so good . This one wasn’t as good , not so good food and guide okay . My husband and I really enjoyed the tour. We stayed at a hotel only for one night in Hanoi. The guide was informative and helpful, and so we have known about Hanoi much better in a couple of hours. Our guide was great, although there was too much walking and with a bigger group of people, often hard to hear him. We had a wonderful guide on 11/20/18 unfortunately we can’t remember his name. He shared lots of information about Hanoi and was full of energy. He even showed us how to use grab instead of using a taxi. Thank you for a great tour. We had a real good time exploring the different food stalls in a vibrant part of the city. We would do this tour again. Good experience trying out food in Hanoi. Was nervous at first but the dishes we tried weren't that crazy didn't have dog or snake or anything like that. Walked around Hanoi in parts that i wouldn't have ordinarily gone to. We spent most of the time at the bbq spot. But the last spot with the view over Hanoi and the egg coffee was probably my favorite. Our guide Faizan was amazing. He spoke English extremely well and was very knowledgeable. He tailored the tour to exactly what we wanted and stayed friendly the entire time. He never hesitated to show us exactly where the good photo spots were or to hold our bags while our photographer at the Taj Mahal took our photographs. Always polite, a true gentleman. We had signed up for the train tour; however, we ended up receiving a driver and drove to Agra from New Delhi. Due to this, we did not receive the breakfast meal on the train so our guide took us to a nice restaurant and we could choose our meal and drink of choice. After we finished the Taj Mahal, we went to a shop where they demonstrated how marble inlay was made. It was interesting. I will warn you, you will be invited to tea and a look at the pieces they sell in the basement. They do not pressure you, it the pieces are so beautiful that I did choose to purchase a piece. After that we went to the Red Fort, again Faizan our guide was amazing! Great photo opportunities and great history. At the Taj Mahal, Faizan negotiated a photographer for us. We chose to purchase the photos for memories as the photographer new exactly what to photograph and how we should pose. Our driver Bunty arrived to our hotel 10min prior to meet up time and welcomed us kindly. When we passed places along the highway he told us what they were. He welcomed questions. The roads and traffic in India are crazy, but Bunty kept us safe. Before returning via car to New Delhi, we stopped at a small souvenair shop while our vehicle underwent an inspection to ensure we were safe to return without car problems. We were given an opportunity to shop. We bought a few things there to commemorate our time in Agra. The only negative thing I have to say is the communication with Maria Tours was difficult prior to the tour. The evening prior to the tour I had not been contacted by anyone and our meet up window was between 4am and 7am. Fortunately, I had an iPhone and Wifi and the agency contact was able to receive iMessage. We discussed the change in itinerary from Train to Cab and ensured we would not be disappointed with our tour. We expected a Street Food Walking Tour, our understanding...food tasting the whole time we walked. We made 5 stops, which the food was great, but we walked MORE than food tasting. Walking that far, we should've made more than 5 stops. Hahaha Our tour guide was very nice and informative. He took us on a city tour, which was good. The food we had was great. This should be called Hanoi Street Food and City Walking Tour. Our tour guide was very good, unfortunately a massive rain storm came in and we decided to take our children back to our hotel as we walked past it as we were all wet through. Other than the weather, it was excellent.